The NFL files a notice of appeal in an effort to reverse a US judge's injunction that blocks a six-game suspension of Dallas Cowboys running back Ezekiel Elliott. 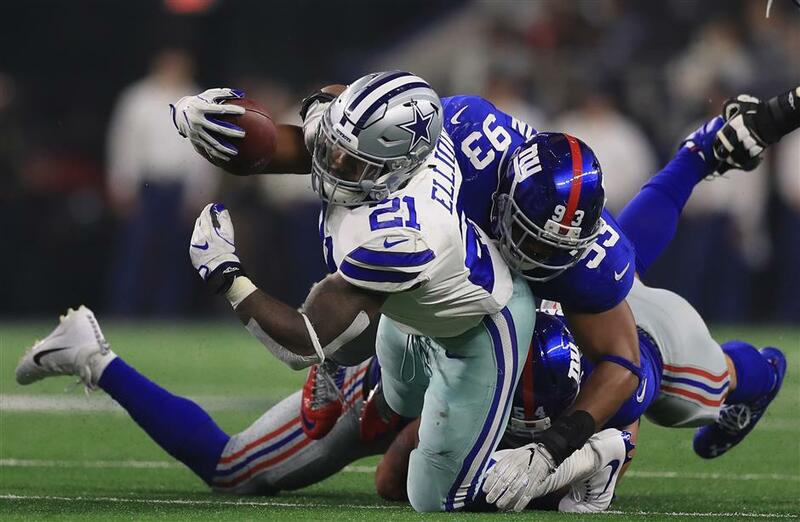 Dallas Cowboys' Ezekiel Elliott (left) is tackled by BJ Goodson (right) and Olivier Vernon of the New York Giants during their NFL game at AT&T Stadium in Arlington, Texas, on September 10, 2017. Dallas won 19-3. The National Football League moved quickly on Monday in hopes of reversing a federal judge's decision that has blocked the league's six-game suspension of star Dallas running back Ezekiel Elliott over a domestic violence case in Ohio. The league asked the judge who ruled in Elliott's favor to stop the preliminary injunction that cleared last year's NFL rushing leader to play while the case is in court. A notice of appeal was also filed with the 5th US Circuit Court of Appeals in New Orleans. The NFL's latest filings came about 12 hours after Elliott rushed for 104 yards in the Cowboys' 19-3 season-opening win over the New York Giants at home on Sunday night. "Just relieved from the fact that I finally get a fair trial," Elliott said after the game in his first public comments since before the Cowboys reported for training camp in July. "I finally get a chance to prove my innocence. And I'm just happy I'm able to be with these guys for as long as it's permitted and just not having to miss time and not being away from them." The 22-year-old Elliott was suspended by Commissioner Roger Goodell last month, and attorneys with the NFL Players' Association contended in a lawsuit that Elliott didn't get a fair hearing in an appeal that was denied. Elliott had already been cleared to play in the season opener when US District Judge Amos Mazzant granted a temporary restraining order and injunction blocking the suspension on Friday. The case could play out for months. New England quarterback Tom Brady's four-game suspension over "Deflategate" was delayed by a year when a federal judge ruled in his favor. Brady served the suspension to start last season after an appeals court reversed the ruling and backed Goodell's authority to suspend him. If Mazzant denies the emergency request to put his own ruling on hold pending further hearings, the NFL could make a similar argument to the appeals court in hopes of getting a hearing within days after Mazzant decides. Without an NFL win on an emergency request in either court, the timeline likely would clear Elliott to play his entire second season after he led the league in rushing as a rookie. The case apparently will stay in the Texas court for at least a week after Mazzant gave Elliott's side until Wednesday to respond to the NFL's request for a stay. The NFL would then have until Friday to respond to arguments from Elliott's legal team before Mazzant rules on the motion, presumably next week. "It may be difficult for the NFL to convince the 5th Circuit that this is truly an emergency," said Gabe Feldman, director of the sports law program at Tulane University Law School. "The argument here is that the NFL could later enforce the suspension." Elliott was suspended by Goodell in August after the league concluded he had several physical confrontations last summer with Tiffany Thompson, a former girlfriend. Prosecutors in Columbus, Ohio, decided about a year ago not to pursue the case in the city where Elliott starred for Ohio State, citing conflicting evidence. The NFL kept its investigation open, and said its conclusions were based on photographs, text messages and other electronic evidence. The league has argued that it acted within the parameters of a labor agreement that gives Goodell broad authority to suspend players. The league also said the appeal process was consistent with its personal conduct policy. "As far as the argument to the court of appeals, we think the scope and review in labor arbitration is very limited and we believe the judge went well beyond what is permitted as far as scope," NFL vice president of communications Joe Lockhart said. Mazzant's ruling took aim at appeal hearing officer Harold Henderson and the NFL, saying decisions not to allow Goodell and Thompson to testify at the appeal were among several factors unfair to Elliott. The running back denied the allegations under oath during the appeal. The judge also faulted the league for what he saw as several efforts to conceal the opinion of co-lead investigator Kia Roberts. She testified at the appeal that she didn't think Thompson was credible and didn't support any punishment for Elliott. Three years ago, the NFL stiffened penalties in domestic violence cases after getting sharply criticized for its handling of former Baltimore running back Ray Rice. Elliott had 1,631 yards rushing last season, helping Dallas to the best record in the NFC at 13-3. He had another 36 yards receiving in the opener against the Giants as the Cowboys beat the NFC East rivals that swept them last season.